Earth Day 2017 found scientists and their supporters marching and speaking out for facts and evidence-based policy decisions on a global scale, with more than 610 marches worldwide. Ten marches in Illinois alone included one in Normal. Organized by Illinois State’s Chad Buckley, an enthusiastic crowd, which included undergraduate students up to senior faculty, of about 300 strong marched from Uptown Normal to the University Quad. At the march, Illinois Wesleyan University Physics Professors Narendra Jaggi and Gabriel Spalding, as well as Illinois State’s Michael Dougherty, associate professor of sociology, and Wolfgang Stein, associate professor in biology, spoke about the importance of science and basic research for society, education, and environmental protection. Rachel Bowden, Distinguished Professor in biology, joined the march “I marched because I am part of the 97 percent of scientists that agree that climate change is real and that human activity is a major driver of this phenomenon,” “I’m marching because I’m about moving forwards, not backwards. Climate change is real,” added Faith Volz, undergraduate biology student, who also participated in the Normal march. 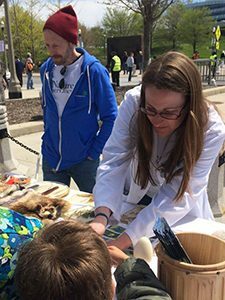 Others traveled to Chicago to join the over 40,000 who marched through Grant Park to the Field Museum for a science expo. 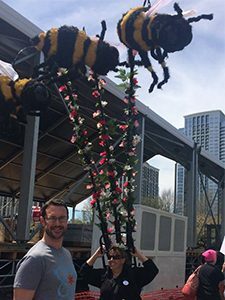 Ben Sadd, assistant professor in biology, said he marched because gaining and respecting knowledge, both basic and applied, are critical for the future development of human society and sustainable interactions with the environment. “Much like human rights, this shouldn’t be a partisan issue, and one day I hope this can be acknowledged by all,” Sadd said. Diane Byers, associate professor in biology, said for her, the complete disregard for outcomes of carefully designed scientific research, particularly in climate change, in favor of unsupported claims is a call to march. For Stein, an important reason to march was the current rise of discrimination against diversity and gender, and the continuous attacks on basic human rights and freedoms. While the fields of science are very diverse, there was one aspect all agreed on at this gathering of hearts and minds—scientific research’s goal is to establish the facts, and develop and test hypotheses using evidence based methods. There is just no alternative.